The dijon mustard I bought is milder in taste than English mustard that I already have. It is also paler in colour and taste not as sour. 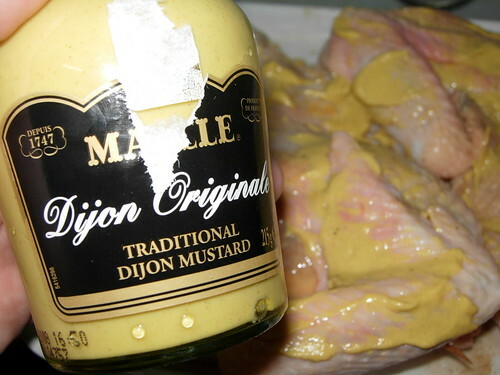 Between dijon mustard and English mustard, I actually like this dijon mustard more. What the recipe calls for are salt, pepper, dijon mustard and red wine. 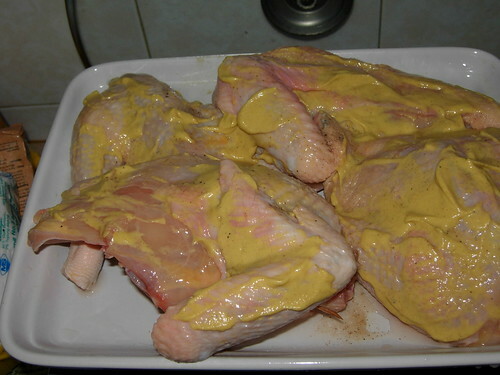 I slather the dijon mustard on the chicken. Then, I cover the chicken with bacon slices and roast it for about an hour at 180 deg celcius. Remember to remove the bacon once they are brown and crispy. I will make another post with all the bacon in my other food blog. Recipe for Easter Roasted Chicken with Dijon Mustard and red wine. The taste? Fantastic and wholesome. My little boy loves the chicken so much, he ate both the chicken drumsticks. *roll eyes* The chicken I bought is not the regular broiler chicken but free range chicken. It is quite huge and costs RM20. However, it is worth paying twice or maybe even three times the price of broiler chicken because the free range chicken has a firmer meat and the meat is more flavourful. I hope you like this Easter dinner recipe. You can also find out how to roast a chicken with my step-by-step instruction. 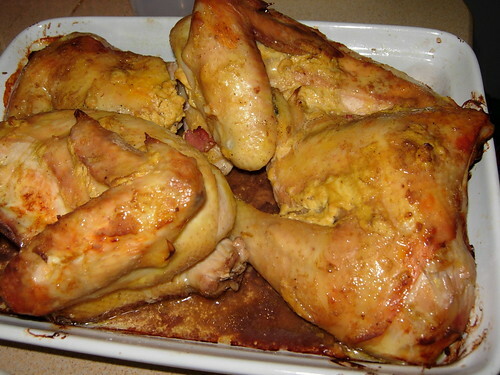 Roast chicken with mashed potato recipe. Another yummy way for the chicken is to mix the dijon with soya sauce and garlic. Sounds strange but it does work! Its so not Malaysian. Where’s the exotic part? The soy sauce?